Worried about the state of American politics and the still-tottering economy? In his new book The Church and the Libertarian, Catholic pro-life attorney, popular Remnant columnist, and widely published author Christopher A. Ferrara provides a Catholic answer to the crisis. Ferrara explores the question: Can one be a faithful Catholic and a "laissez-faire" libertarian? He warns against Catholic acceptance of yet another version of "More Better Liberalism," when it is Liberalism, both political and economic, that has destroyed Christian civilization and brought the entire Western world to the brink of total ruin. Far more than a tale of woe, however, this book presents a stunning positive case for Catholic Social Teaching as the one way back to civilizational sanity. 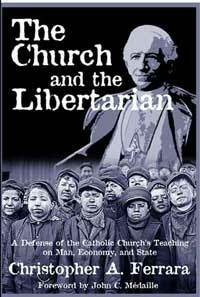 The Church and the Libertarian presents practical ways of restoring true liberty in present circumstances, including a Catholic vision of "microeconomic life" in a world veering madly toward both political and economic collectivism, the latter imposed by so-called “free” market entrepreneurs as much as it is by government. "Ferrara brilliantly explains the application of Catholic social teaching to economics and the State like no one before." · Has the “free” market ever actually been free? · Is even Capitalism spinning out of control? · Is economic liberalism in direct opposition to binding Catholic doctrine on man, economy and state? · Can a misguided defense of private property actually help destroy private property? · Do some radical libertarians actually undermine true liberty? · “Audit the Fed,” “abolish the Fed,” “return to the gold standard,” “nullification” -- real solutions or just more domestic jingoism? · What about Ron Paul? Tom Woods? The Libertarian revolution? · How the Supreme Court—right now—could overthrow the tyranny of liberalism and change the course of world history with a few paragraphs in a single opinion. · Distributism: A serious alternative, or just a lot of cow milking and garden planting? · A practical, point-by-point Catholic plan for taking back our lives from the tyrants who have stolen our freedom as sons and daughters of God. This book could change the very terms of the debate over “liberty” and what it means. "A superb example of how reasoning that includes the moral and supernatural orders enlightens and completes the natural order…. Mr. Ferrara has shown how Catholic teaching links the natural to the supernatural in social life. People of whatever faith tradition, Protestant, Buddhist, Islamic, etc., will, I believe, find this work an excellent demonstration of how faith enlightens reason…"
"From soup to nuts, Ferrara’s engaging book simultaneously puts the final nail in the Austrian coffin and breathes new life into the social vision of the Catholic Church. This future classic should be required reading for the layman and seminarian alike; especially those enamored by Acton and Mises." "More than a brilliant polemic against a dangerous ideology and its high-profileCatholic defenders (a sad but necessary duty), The Church and the Libertarian is also a dazzling vindication of Catholic social teaching. I found it not only mind-clearing, but soul-stirring." former editor Conservative Book Club; creator of Regnery Publishing’s "Politically Incorrect Guide" series. "I applaud this book, and hope it gains a wide readership." "Deals a fatal blow to premises that conflict with perennial Catholic moral philosophy. Ferrara’s wit and penetrating style make this book easily accessible to the non-expert intimidated by technical-sounding arguments of modern sophists. Every Catholic serious about understanding the application of Catholic economic doctrine must read this work." You can order by telephone too! MasterCard, VISA and DISCOVER accepted!